A simple 50/50 Asset Allocation Model is based on a passive two-asset class portfolio. It was built to reduce volatility of returns, decrease risk, and provide relatively stable performance in comparison to the S&P 500 Index alone. This model is created by investing 50% of assets in the exchange traded fund (ETF) linked to the S&P 500 Index, and the remaining 50% of assets invested in another ETF linked to a long-term US Government Bond Index with maturity of 20 years or longer. Using back testing, this allocation was proven to decrease volatility and produce stable returns during 2003-2012 time periods. The main difference between this Simple 50/50 Asset Allocation Model and other similar 50/50 bond/equity allocations is that the model described in this paper is based on a long-term US government debt. Recent global financial crisis has changed the behavior of returns for corporate bonds and the US equity. Many long-term investors believe in a strategic asset allocation, which includes a combination of fixed income and equity. Historically, these distinctively different asset classes provided good diversification. However, during the financial crisis of 2008, the correlation between the returns of corporate bonds and equity increased causing the diversification benefits of a typical 50/50 equity-bond portfolio to decline. For example, iBoxx $ Investment Grade Index has returned only 0.96% in 2008 according to iShares (2012, October 7). At the same time, SPDR S&P 500 ETF, ticker SPY, has lost 36.80% (see table 1 below). Such poor performance during the financial crisis has diminished the diversification benefit of a typical equity/corporate bond asset allocation model. The timing of this paper is important because the Simple 50/50 Asset Allocation Model looks into structural changes; increase in correlation between corporate bonds and equities; and provides strategic asset allocation with diversification benefits that remain intact during a severe financial crisis; such as, the financial crisis of 2008. Combining the performance of S&P 500 Index with the performance of long-term US Government Debt, the Simple 50/50 Asset Allocation Model can decrease volatility/risk, and should provide stable performance over time. These two attributes are very important for most investors as they solve an essential task of market timing. It should not matter when the investment is made using the Simple 50/50 Asset Allocation Model. The dynamic risk management characteristics of the model automatically increase risk exposure during good market conditions and decrease risk exposure during bad market conditions. The correlation between the returns of the US equities and the US government bonds increases when economy is doing well and decreases when economy is doing poor. As the result, the investor is not burdened by the task of market timing and forecasting the near-term future. The fundamental principles of investing half of the assets in bonds and half in equities have been tested by time and advocated by renowned investors. This model is consistent with ideas of Benjamin Graham and John C. Bogle. Benjamin Graham has described 50-50 division as a simple model, which is appropriate for a conservative investor and provides both upside in a bullish market environment and better performance vs. more aggressive investors in a bearish market environment according to Benjamin Graham (2003). According to John C. Bogle (2011, April 27), founder of the Vanguard Group, investing 50% of assets in equities and 50% in bonds is a better asset allocation than many other models out there. The model in this article is somewhat different from what Benjamin Graham and John C. Bogle advocated as its 50% bond exposure is based solely on long-term US government debt. In this paper, the Simple 50/50 Asset Allocation Model is specifically based on two securities: SPDR S&P 500 ETF, ticker SPY, and iShares Barclays 20 Year Treasury, ticker TLT. In order to make a Simple 50/50 Asset Allocation Model even easier to implement than to understand, we invest 50% of money in SPY, and 50% in TLT. The historical back test and the entire analysis below are based on these two ETFs. Keeping the asset allocation steady over time, the model has unique ability to reduce risk during a recession and increase risk during an expansion on its own. Risk exposure of the Simple 50/50 Asset Allocation Model changes dynamically based on a particular stage of a business cycle. The correlation of price movements between government bonds and corporate stocks increases during good times and decreases during bad times. For example, during a bullish stock market performance in 2003-2006, the daily correlation of price changes between SPY and TLT was increasingly positive. This correlation increased from 0.04 in the year 2003 to 0.67 in the year 2006 (see the chart #1). In contrast, just prior to the financial crisis, this correlation started to decline from 0.67 in the year 2006 to 0.02 in the year 2007 and to -0.71 in the year 2008. Interestingly, the risk off adjustment took place just prior to the stock market decline of 36.80%. The Simple 50/50 Asset Allocation Model demonstrated unique ability to hedge a downside risk by reducing the correlation between TLT and SPY price movements prior to the financial crisis. Correlation is calculated based on daily adjusted close price changes for SPY and TLT. Performance for SPY is also based on adjusted close prices. Data is provided by Yahoo! Finance. By holding 50% of assets invested in the long-term US Government Bonds, the Simple 50/50 Asset Allocation Model can provide a hedge against a stock market decline; such as, the financial crisis of 2008-2009. During a recession, long-term US government bonds can benefit from the decrease in interest rates, deteriorating corporate credit ratings, and increase in demand by investors. The reasons that the Simple 50/50 Asset Allocation model is based on long-term government bonds are that they have a greater duration and greater interest rate sensitivity necessary to move bond prices significantly enough to offset a decline in stock prices during an economic recession. By investing the remaining 50% of the portfolio in a broad market index, the model should provide growth and cover possible fixed income losses during an economic recovery and growth. The dynamic risk management characteristics of the model are somewhat similar to a tactical asset allocation where investor makes changes to the portfolio based on short-term economic outlook. During an early stage of economic recovery, the Simple 50/50 Asset Allocation Model switches to a risk off mode: increase in correlation between SPY and TLT daily price movements. There are no changes in the federal funds target rate expected and investors continue to earn a positive return on a fixed income part of the portfolio as well as on the equity portion. In contrast, during the economic cycle when economy starts to slow, the model switches back to a risk on mode: the correlation between SPY and TLT daily price movements decreases. During this time, the Federal Reserve Bank (the Fed) is likely to pursue more expansionary monetary policies and decrease interest rates and/or buy government bonds. These policies will provide positive returns on long-term government bonds’ holdings, and partially or fully offset the decrease in stock prices. The Simple 50/50 Asset Allocation Model has an embedded natural risk hedge which decreases the price correlation of SPY and TLT and lowers the standard deviation for the model during bad economic times. 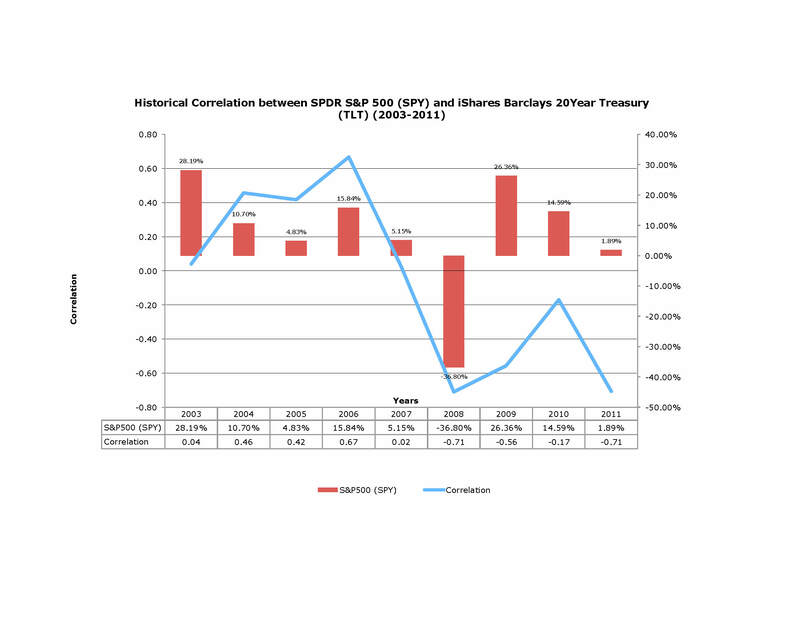 Risk of the Simple 50/50 Asset Allocation Model, as measured by the standard deviation of annual returns, is much lower than the risk of the SPDR S&P 500 ETF (SPY) and iShares Barclays 20 Year Treasury ETF (TLT) alone. The Simple 50/50 Asset Allocation Model reduces volatility and earns a stable return in comparison to the performance of SPY or TLT exchange traded funds alone. The financial crisis caused SPDR S&P 500 ETF (SPY) to decline by 36.80% in 2008; where as, the Simple 50/50 Asset Allocation Model has declined by only 2.86% during that time period (see chart #2). The performance of the Simple 50/50 Asset Allocation Model has also proven to be less volatile and relatively stable in comparison to the SPDR S&P 500 ETF (SPY) and iShares Barclays 20 Year Treasury ETF (TLT) alone during 2002-2012 years (see chart #2 and table #1). The initial investment of $100,000 on July 31, 2002 was allocated 50% to TLT and 50% to SPY; the rebalancing of the portfolio was done on an annual basis to keep the ratio constant at 50/50. Table 1. Annual Returns are based on adjusted close prices. Data provided by Yahoo! Finance. YTD performance covers the time period between 01/01/2012 – 06/29/2012. As recent history showed, by investing 50% of the portfolio in a passively managed S&P 500 Index ETF and another 50% in a passively managed long-term US government bond ETF, the investor can decrease risk without sacrificing the return over a long-term time horizon. This model portfolio has many advantages: is well diversified, does not carry an active risk exposure, easy to implement, and is a low cost investment strategy. 1) During Initial Recovery: S5050 (increase)­ = 0.5*SPY (increase)­ + 0.5*TLT (increase)­. During initial recovery bond yields continue to decline as the risk of inflation is low, and stocks start to rally as the future expectations becomes brighter. The model should provide a positive return. 2) During Early Upswing: S5050 (increase)­ = 0.5*SPY (increase)­ + 0.5*TLT (decrease). During early upswing, long-term bond yields start to increase causing bond prices to decline and the stock prices continue to rise. The increase in stock prices is likely to be greater than the decline in bond prices; thus, the model should have a positive return. 3) During the Late Upswing: S5050 (increase­/decrease) = 0.5*SPY (increase­/decrease) + 0.5*TLT (decrease). The economy is at the fine line between soft landing and recession. Stock performance is volatile, but prices may continue to increase. The Fed may start monetary policy tightening by pushing rates higher, which will cause bond prices to decline. The Simple 50/50 Asset Allocation Model can increase in value if equity prices increase by a greater amount than the decline in bond prices; otherwise, the model will cause a loss on investment. 4) During Slowdown and Early Stage of Recession: S5050 ­(increase/decrease) = 0.5*SPY (decrease) + 0.5*TLT ­(increase). During slowdown, bond yields reach their pick and start to fall causing bond prices to rally. Stock prices are likely to decline. During the early stage of recession, bond prices continue to increase, and stocks decline further. The historical example can be seen during the year 2008 when the financial crisis started (see chart 3). SPY lost 36.80$ and TLT gained 31.07% during 2008. 5) During Late Stage of Recession: S5050 ­(increase) = 0.5*SPY (increase)­ + 0.5*TLT (increase)­. During the late stage of recession, bond prices continue to increase as yields decline, and stock prices may start to recover as markets anticipate recovery. The model will have a positive return. (The five stage business cycle model was described in the Managing Investment Portfolios: A Dynamic Process, Third Edition, John L. Maginn, CFA, Donald L. Tuttle, CFA, Jerald E. Pinto, CFA, and Dennis W. McLeavey, CFA, John Wiley & Sons, Inc. 2007. p. 176-177). There is no active return earned by investor. The model is based on two passively managed ETFs that provide a low cost diversification. It is not immune to hyperinflation or even a significant unexpected spike in inflation. Unexpected increase in inflation will cause TLT to decline in price. TLT provides exposure to long-term, fixed coupon, US government debt which is very sensitive to changes in interest rates. As inflation increases, the price on TLT will decline. The Simple 50/50 Model can perform differently in the future if the US government credit rating deteriorates further. The US Treasury may lose its safe haven status and cause structural changes in the behavior of different asset classes. 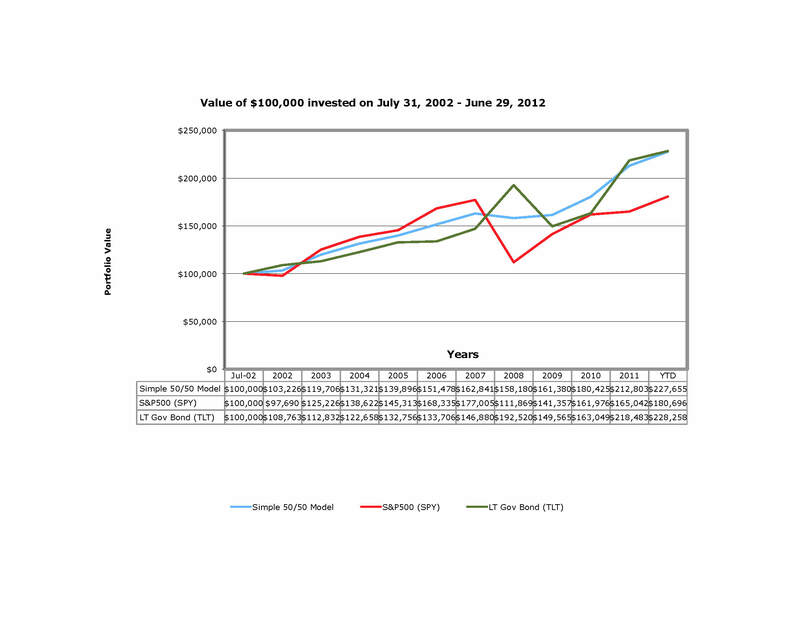 Structural changes may increase risk and decrease returns of the Simple 50/50 model. There can also be a situation during an economic slowdown or even a recession when the Fed decides to increase interest rates (inflationary recession); this restrictive monetary policy will have a negative effect on both long-term government bonds and the US equity prices. As the result, the model will fail to provide a hedge against the stock market decline. The Simple 50/50 Asset Allocation Model is both strategic and tactical in nature. It starts with 50% allocated to a broad US equities’ market and 50% allocated to long-term US government bonds. The allocation remains constant over time due to annual rebalancing. It has embedded dynamic risk management which can be compared to a tactical asset allocation. The risk exposure increases during good economic conditions and decreases during bad economic conditions by automatically adjusting the correlation between the price performance of the US equities and the US long-term government bonds. Also, the dynamic risk management structure solves the task of market timing. The model’s risk exposure will be adjusted to specific market conditions and for a specific time during which the investment is made. As the result, the historical performance of the Simple 50/50 Asset Allocation Model is stable with low volatility. This model is designed to provide dynamic risk management and steady returns over time. It does not replace active money management strategies. The foundation of the model supports a well know saying “Don’t Fight the Fed.” The Fed uses its monetary policies to influence the yield curve. Changes in the yield curve have a direct effect on prices of long-term US Treasuries. As long as we trust the Fed to implement smart and timely monetary policies, and be able to avoid inflation, the 50/50 should do well in the future. Disclosure: The back test of the model was based on two ETFs with annual fees. Annual report expense ratio (net) for the SPY is 0.09% and TLT is 0.15% at the time of writing this article. The return analysis is based on the daily adjusted close prices. The risk analysis; such as, standard deviation and correlation, is also based on the adjusted close prices for each ETF. Historical performance was calculated assuming annual rebalancing and does not guarantee or represent future returns. This model is not suitable for all investors, and may cause a loss of principal, please consult with your financial advisor before making any investment decision. The author of this paper did not receive any financial compensation from State Street Global Advisors or Barclays, and is not invested in SPY or TLT at the time of writing this paper. This paper was written as an opinion only. The data is not guaranteed to be accurate or complete. Graham, Benjamin (2003) “The Intelligent Investor” Revised Edition. HarperCollins Publishers Ltd. p. 90-91. Maginn, John L., CFA, Donald L. Tuttle, CFA, Jerald E. Pinto, CFA, and Dennis W. McLeavey, CFA (2007) The five stage business cycle model was described in the Managing Investment Portfolios: A Dynamic Process, Third Edition, John Wiley & Sons, Inc. p. 176-177.